"I'm not heading nowhere. None of us are." Phillip Noyce is easily one of the most underappreciated and versatile directors currently working. He blends entertainment and art effectively, telling engaging stories that offer unique perspectives on human nature. 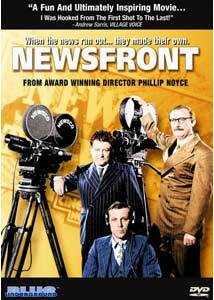 Newsfront marks his first major worldwide hit, chronicling the lives of fictional newsreel cameramen in post-World War II Australia. It blends social commentary with comedy, drama, and adventure. I'm not sure if it merits the praise thrust upon it by critics, but it stands as an earnest depiction of journalism's unsung heroes. Newsfront is to the newsreel industry what Network is to TV news, centering more on the entity of a company than on any specific individual. The screenplay by Noyce, from an earlier work by Bob Ellis, looks at its subject with a distinct nostalgia for the days of old when people saw newsreels in theaters before watching a feature film. Len Maguire (Bill Hunter) and Chris Hewitt (Chris Haywood) are the top journalists for Cinetone News, rivaling Charlie Henderson (John Ewart) of Newsco International for the best angle of Australia's events. Back in the studio, the cameramen deal with politically motivated editors, business-oriented managers, and the numerous concerns of journalistic ethics. A.G. Marwood (Don Crosby) runs Cinetone professionally, but longs for his former career as a movie producer. Things become complicated when Newsco's manager, Len's brother Frank (Gerard Kennedy), coordinates with foreign countries to secure better coverage of international events. Soon enough, however, all of them will find TV usurping their purpose in society and each will need to accept the inevitable consequences. There's really no plot to speak of here, but rather a collection of various vignettes chronicling the historical goings on of Australia in the early 1950s. Professionally, the characters contend with the dangers of floods, fires, censorship, and changes in journalism. Personally, they deal with unwanted pregnancies, marital strife, and death. Noyce juxtaposes these two aspects of the characters lives, using the story to convey the larger societal changes beginning to take form during this period. The sets and costumes lend tremendous authenticity to the film, and Vincent Monton's classical cinematography (mixing color with black-and-white sequences) emulates the cinematic stylings of Gregg Toland and Freddie Young. This is a well made film and always interesting, but not entirely satisfying on an intellectual level. There's no conviction in Noyce's storytelling, only form. He gets good work from his actors, but never really seems committed to how things will work out for the characters. The filmmakers sympathize with the left's fear of a police state emerging during the early 1950s, but there's no gusto in its depiction of journalists fighting to use their work to promote a better vision. Agree or disagree with the film's politics, it should make you react to them. I was never stirred by the movie on either an emotional or intellectual level; rather, I left cold but for the warm physical reaction created by its craft. Unlike his more recent work, Noyce doesn't seem to truly grasp the complexities of his characters. Len Maguire is more of an archetype than a real person and when his personal life begins to tear apart at the seams there was no resonance for me. Perhaps if I was an Australian national, I would appreciate the movie more. As things stand, however, I admire Noyce's technique, but not his story. Image Transfer Review: The anamorphic widescreen transfer looks nice, with a good sense of depth, sharp contrast, and solid colors. It's slightly grainy, but I suspect this is largely due to the production's meager budget. Unfortunately, the movie's OAR is 1.66:1 and the DVD mattes the picture to 1.78:1. Audio Transfer Review: The Dolby Digital 5.1 mix is extremely front heavy, but sound separation across the front sound stage opens up the mix nicely. Rear-channel activity is limited, but some atmospheric effects do engage the surround speakers. There's nothing special about the mix, but dialogue is always audible. There's also a Dolby Stereo 2.0 mix available. Extras Review: The special features kick off with an audio commentary by numerous members of the cast and crew (not everybody introduces themselves). Director Phillip Noyce, producer David Elfick, and co-writer Bob Ellis dominate the track, with the other participants only speaking for specific scenes involving their work. Every aspect of the production is covered here, creating one of the most informative commentaries I've ever heard. Noyce sprinkles some excellent anecdotes about shooting the movie with explanations of his artistic decisions, but Ellis' accent is too thick to fully discern what he's saying. Apart from that complaint, however, this is an excellent commentary. There's also a pair of featurettes, The Last Newsreel (11m:07s) and 1978 Australian Film Institute Awards Excerpts (03m:42s). The former is a mock newsreel, mixing actual footage of old Australian movietone news with new material explaining how these old movies are preserved and are an important part of history. The award ceremony is narrated by Noyce, who offers some amusing stories about the day's events as the picture shows various actors and crew members accepting their honors. There are also some good production notes that explain the movie's origins in the script-writing phase, as well as trivia about its production and the critics' reaction. Rounding out the special features are various DVD-ROM features for PC users and the movie's original theatrical trailer. This is a fine, if not extensive, collection of supplemental material. Phillip Noyce's Newsfront is a technically dazzling movie, but emotionally cold. This DVD from Blue Underground showcases a nice collection of extras, but unfortunately the film's restoration is a mixed bag.